One type of immigration record that you can find on the web is passenger lists. 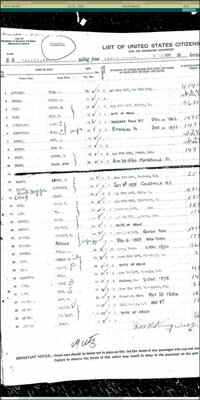 Passenger lists are manifests of who traveled on a particular ship. You can use passenger lists not only to see who immigrated on a particular ship, but you can also see citizens of the U.S. who were merely traveling by ship (perhaps coming back from vacation in Europe). To find passenger lists, you can try using a general search engine or a genealogically focused search engine. This is a particularly good strategy if you don’t know what the name of the ship was or the year that your ancestors immigrated. If you do know the name of the ship, a comprehensive genealogical index may be more appropriate. Go to the Ask.com search engine. The search box is located at the top of the home page. In the search field, type your search terms and then click Find Answers. For this example, type Martin Saunders on the ship Planter. Click a promising link from the list of results. Another link on the results page reads “Ships Passenger List — PLANTER of London for Boston Massachusetts.” In the abstract that you access by clicking the link, you see that a Martin Saunders, age 40, sailed on the Planter. Another source for passenger lists is the Immigrant Ships Transcribers Guild passenger-list transcription project. Currently, the Guild has transcribed more than 14,000 passenger manifests. The passenger lists are organized by date, ship’s name, port of departure, port of arrival, passenger’s surname, and captain’s name. You can also search the site to find the person or ship that interests you. If you know (or even suspect) that your family came through Ellis Island, one of your first stops should be the Ellis Island Foundation site. The site contains a collection of 25 million passengers, along with ship manifests and images of certain ships. Go to the Ellis Island site. The search box is located just under the main header. Type the passenger’s name in the search boxes and click Start Search. You should see a results box with the name of the passenger, residence (if stated), arrival year, age, and some links to the passenger record, ship manifest, and the ship’s image (if available). For this example, type Harry in the Passenger’s First Name field, and Houdini in the Passenger’s Last Name field. When you click Start Search, you get a list of three results — entries for travel in 1911, 1914, and 1920. Click the ship manifest link for the 1920 record. When you click the link to see the ship manifest, the Ellis Island site advises that you must be a registered user. If you’re already a member, follow the prompts to sign in, and then go to Step 6. If you’re not yet a member, click the Register Now link and go to Step 5. Click on the Yes, I am new to this site link. Complete the online membership registration form, then Click Submit. You must provide your first name, last name, e-mail address, user name, password (which has very specific requirements), and click the check box for the terms and conditions. Review the information about this manifest and click the thumbnail picture of the manifest to enlarge and explore the digitized copy of the record. The figure shows the manifest for the ship Imperator that sailed from Southampton on July 3, 1920 and arrived on July 11, 1920. If you scroll through the manifest online, you can see that Harry was traveling with his wife.